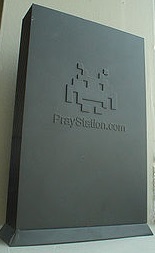 The Praystation is a medium size gray rectangular box. When activated, it turns into something of a portable temple. This item is useful for the penitent hero, as he is always looking for a more holy place in which to pray on his quests. When activated, and upon sufficiently devout prayer, your God will be richer by one accumulator charge. Note: you do need a power source and a place to plug in the A/V cables. Unfortunately many a hero has found it disappears randomly while using it, as well as being infamous for having technical difficulties due to buggy software. Stoke up your power source to a full head of steam and attach all cables including the Network coaxial. Hope that your God is now more powerful, wiser and benevolent such that they will find power to resurrect your mangled corpse in time of need. 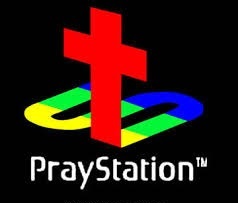 Yell out in the strongest Japanese accent possible, "praaaaaaaystation"
This artifact grants 1 additional accumulator charge, and requires 50% godpower to activate.